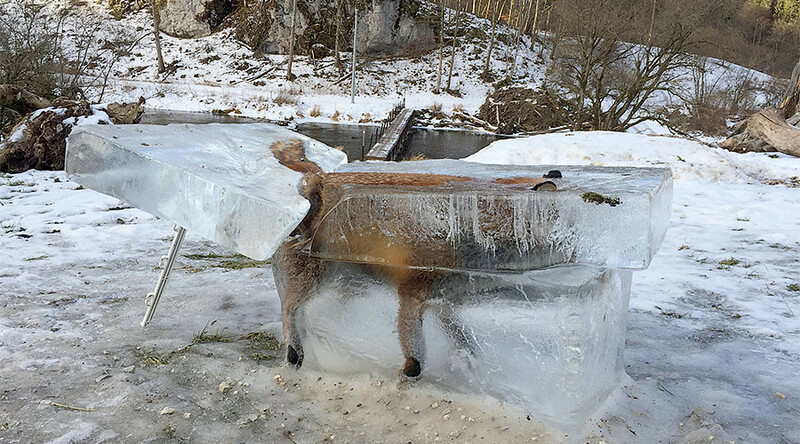 A fox was rescued from a river a bit too late after a hunter found the drowned animal completely frozen in a block of ice. Franz Stehle cut the fox out and brought him to his family’s hotel where he now welcomes guests. Stehle found the animal in the Danube river in Fridingen, southwestern Germany. A warm spring is suspected of making the ice appear deceptively solid, resulting in the doomed fox falling through the surface and drowning, reported Schwäbische Zeitung . It was four weeks after Stehle discovered the fox that he cut him out of the river using a saw – originally intending to discard his corpse. "The ice fox is perhaps a warning to those who want to go on the ice of the frozen Danube," he said. Stehle decided to keep the fox instead of discarding him, putting him on display outside his family’s hotel, until it gets a little bit warmer at least. The fox wasn’t the first animal to find a cold grave in the Danube according to Stehle, who told DPA that deer and boar have also been frozen in the lake during winter. The animal has now been immortalized with the hashtag #BestCarcass on Twitter, alongside the unlucky participants below.